Paramaribo, the capital of Suriname (Dutch Guyana), was home to another ITU Level I Coaching Course focused on the development of triathlon in emerging National Federations. This course represented the continuation of the development process initiated in 2012, when an ITU Level I Technical Officials Course took place in Suriname. With more structured races and more participants interested in triathlon, it was important to encourage local sports coaches to get more involved in the sport and provide them specific knowledge on triathlon coaching and training through the course, a landmark for triathlon in Suriname. 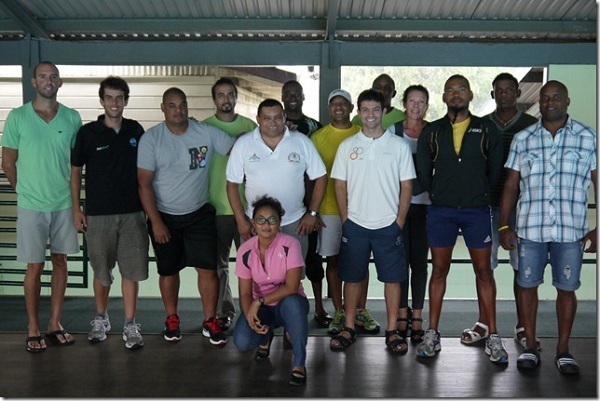 A total of 14 coaches from five different countries (Aruba, Brazil, Puerto Rico, Suriname and Trinidad & Tobago) attended the course presented by ITU Development Facilitator Rodrigo Milazzo over five days. The seminar mixed theoretical and practical sessions tailored to provide the best overall triathlon coaching learning experience for them. Also, the day after the closing of the course, all participants had the opportunity to attend the first national triathlon competition of 2013. All the activities took place at the OASE complex, a local quality club that kindly provided all the facilities necessary for the staging of the course. Caroll Heuvel, president of the Surinamese Triathlon Federation, arranged all the exceptional conditions for the presentation of the course and was very pleased with its effect on their local coaches, projecting a significant outcome for the development of Surinamese Triathlon in the nearby future. ITU will continue its Sport Development activities in the Americas region through PATCO, which has already planned other coaching courses for 2013 that will benefit other continental emerging National Federations.